After a hectic journey from wildly successful Kickstarter campaign to mass production, the three-person team of Calder Limmen, Erik Stakenborg, and Jeroen Langelaan have put together something hugely ambitious and quite incredible: the Wooting One analogue mechanical keyboard. If there’s anything a keyboard cannot do that a controller can, it’s pressure sensitive control. Keyboards are firmly in the digital camp of binary input – 1s and 0s, on or off – and that directly affects how we play games on PC and traverse 3D landscapes. The Wooting team weren’t satisfied with this reality and set about bringing the concept of analogue keyboards – ones that offer a range of inputs per switch – to the mainstream. The result is the Wooting One. Thought up back in 2015, the Wooting One is a tenkeyless mechanical keyboard that adds a whole new depth of input powered by the Flaretech optical switch. You’ll need to tweak your game settings a little to get the Wooting up-and-running, although instructions for some of today’s top titles are available within the knowledge base. The initial setup occasionally requires a little bit of fiddling around in text files, but most of the time consists of enabling controller support and removing keyboard bindings for WSAD within the in-game menus. With analogue enabled, it can take a little while to adjust. It’s so easy to get caught up in the game that you revert back to slamming keys with little regard for gentle pressure sensitivity. However, once it clicks (mentally, not physically), gradual key presses become almost second-nature – sneaking up on enemies and peeking around corners is easier than ever. You’re not limited to the directional keys, either. Double keystroke (DKS) allows for a key to represent two inputs. One input will register at the first actuation point, and another input will register at the second actuation point. So how does it all work? The Flaretech optical switch utilises a light sensor built straight onto the PCB, rather than a conductive switch found within a traditional mechanical switch. The feel of a mechanical switch is still present – in fact, the Flaretech Blue is one of my preferred tactile switches – but the limitations of a physical on/off switch are gone. 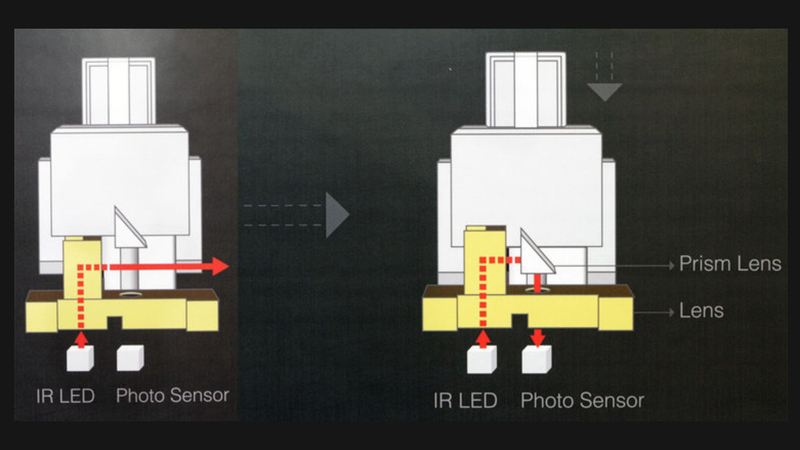 Due to the sensor design, the Flaretech switch is able to read input at any level of key press. That means that you could press it lightly and the sensor will recognise a slight key actuation. You bottom out the key and the sensor recognises you’ve bottomed out the key – but also every movement in between. The result is a switch that allows input almost identical to that of a controller’s analogue stick. 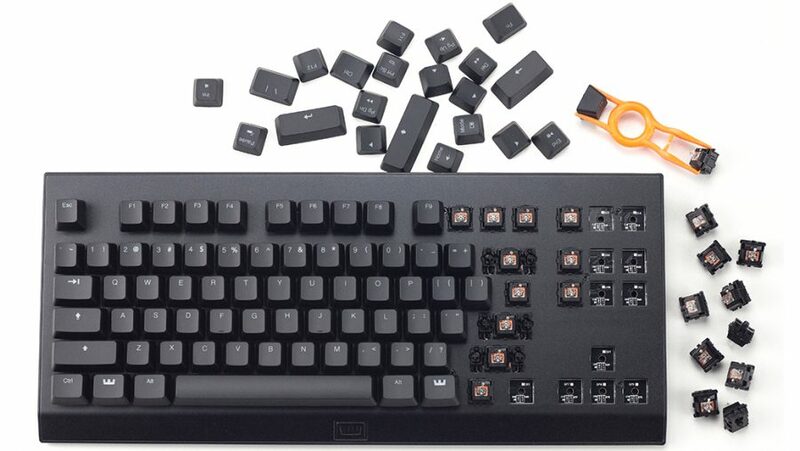 You still have n-key rollover, anti-ghosting, and a less than 1ms response, but this ingenious approach also has various benefits over the traditional mechanical design. First off, there’s no debounce time as optical switches have no keychatter (double input due to vibration). 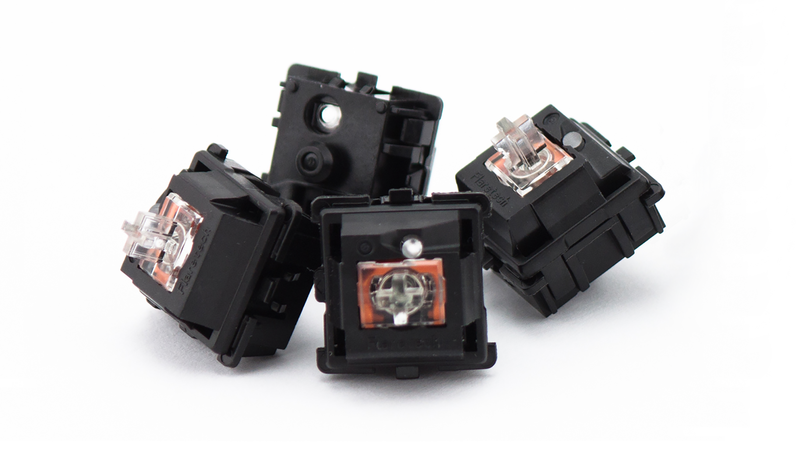 Also, without a physical switch to degrade over time (as found in a traditional mechanical switch) the Flaretech prism switches – available in Red Linear55 and Blue Clicky55 – are rated for a whopping 100 million keystrokes. If, for any reason, one of your switches does reach the end of its life a little early, simply replace it with one of the spare switches within the ‘First Aid Kit’ – a set of four red and blue switches included with every Wooting One. All the important tech is on the PCB (printed circuit board). But wait, there’s more, as even when in use as a digital switch, the optical design of the Flaretech offers control otherwise unavailable with a traditional switch. The actuation point – or point where the key switches from off to on – can be tweaked to your liking. Whether you want to change the actuation point to be closer to bottoming out the switch or to only require the lightest press, you can simply set the distance in the fantastically-named Wootility software. I hate to say something is surprisingly good, because that implies I held a preconception that it wouldn’t be – some of the largest keyboard manufacturers in the world struggle to put together concise software, so I think my previously held beliefs were largely justified. However, the Wootility is surprisingly good. It’s a very clear, simple, and concise piece of software. It’s not perfect, but across the brief period I’ve spent with it, it has received various ease-of-use, design, backend, RGB effects, and feature updates. You want to know what the devs are working on next? Each update and its progress is noted in the Wooting Trello roadmap. You want to see the list of current bugs? It’s public knowledge. You need support? You join the Discord channel and ask the creators directly. This level of transparency is borderline madness – at least, it is when compared to what we’re used to. But the transparency is there because of a confidence in the product, and rightfully so. The unit is built well and both the manufacturing and sourcing of the components are well documented on the Wooting blog. The keycaps are laid out clearly, and there’s a convenient ‘mode’ key for swapping between digital and analogue profiles. 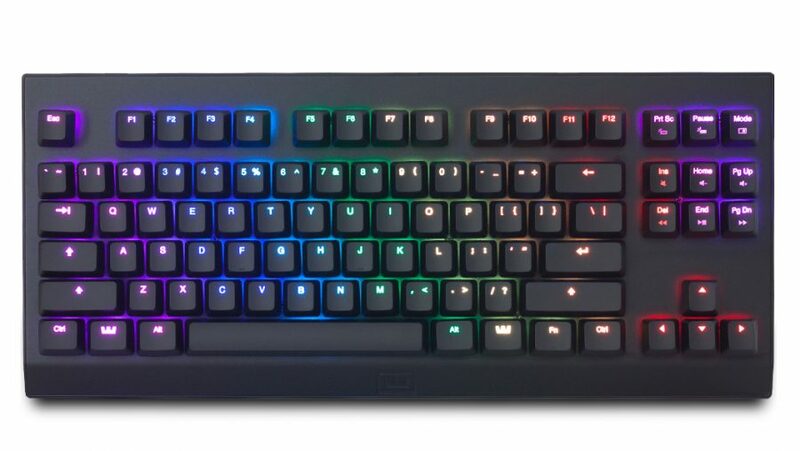 There’s RGB per-key lighting powered through the app – which just received support for RGB effects, too – and even the top-plate is removable, just in case. It’s an ambitious project to bring analogue into the mainstream – but if anyone can do it, it might just be Wooting. The Wooting One ticks all the boxes, and the Flaretech switch is a breath of fresh air among the onslaught of Cherry boards. As for price, the Wooting One starts out at $140 / €140. That’s with a choice of the Red or Blue Flaretech switch, the first aid kit with four of each switch, and a braided removable Micro-USB cable. While the complete package isn’t perfect – the keys are a little wobbly and the software still has a way to go – the Wooting is consistently developing and improving at a blistering pace. Isn’t that what crowdfunded products are for, after all? The Wooting One is the standard bearer to all others wishing to follow in its footsteps. They don’t have the access that larger companies enjoy, nor the funds, yet Wooting are etching out a market for themselves rather than lining up behind the competition. For that reason – alongside the hugely ambitious and superb product – the verdict seems clear. The ambitious Wooting One analog keyboard isn't necessarily perfect, but the company has been updating its software package continually since launch. 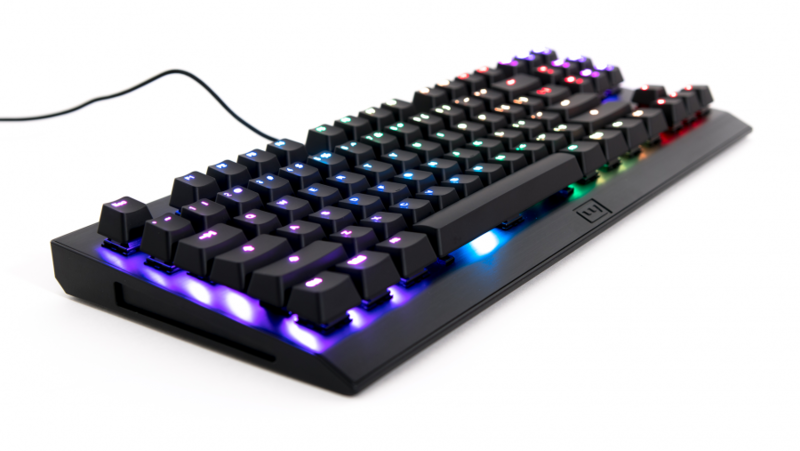 And it has more functionality and innovation than any other gaming keyboard we've seen in years.